Hi Kenny! You’ve been a big help to me in the past with my gardening stuff, so I just kind of wanted to show you what I got going on out there with my tomatoes. You had mentioned the problems you had with cages and trellises… I did too so I started making my own trellises. They cost about 10 bucks each to make and take about 2-3 hours each, but they never bend or break, can be used for years and years, and I think they look beautiful. These are not buried in the ground. I used 4 pieces of 6 inch pipe about 18 inches long… filled them with pea gravel about 6 inches, put in the trellis, leveled it, then filled it to the top with pea gravel (actually the top ½ inch is white marble for looks). This way, the boards NEVER rot, I can remove it annually and redo stain and waterproof if necessary and the whole process of removal and re-installation takes about 10 minutes. I am sending a picture of it early in the season so you can see the trellis and one late in the season so you can see the size the things get to in it. It is very heavy with fruit. I have been pulling tomatoes since the 4th of July (ended up being a pretty easy day to remember). A little magic fertilizer system helps with the size… the picture with me in it was taken about the middle of June; the plant is well over 6 foot now and has consumed the trellis. Oh, by the way, you can’t really see them in the pictures, but the “extension” of the trellis serves a purpose later as the plant grows bigger around. I take wire insulation hangars, drill holes in the ends of the “extensions” and put the wire through them. These hangars are very strong and take a heck of a lot to bend them. In essence, you end up with a “dual layer frame” type of trellis, and the outer layer poses no problems in reaching past into the plant to harvest yer bootie! As John has just shown, there are many angles to take in constructing a trellis or structure for supporting all of your homegrown veggies and fruits. There’s no right or wrong way, just whatever works for you. 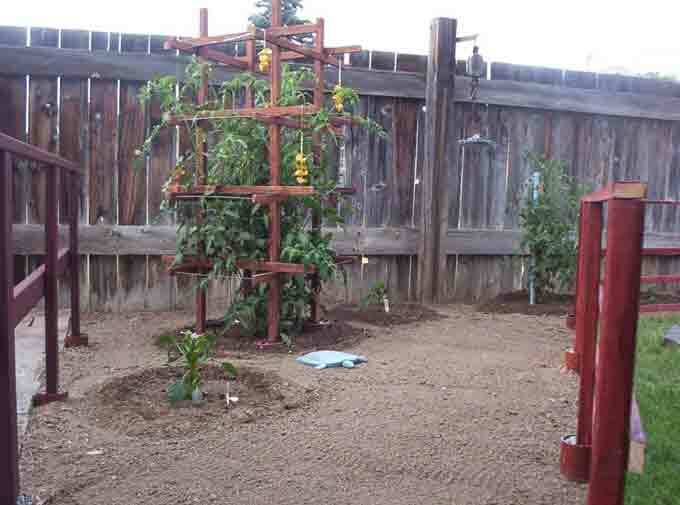 The trellises can also be adapted or modified to support other vegetables and fruits. For example squash plants and even melon vines can be trained to grow and bear fruits on a trellis. I still love the support system that I shared in my tomato trellising video, but there are so many great options and techniques for supporting your plants and they will all help improve production, plant health, and help maintain order out in the vegetable patch. 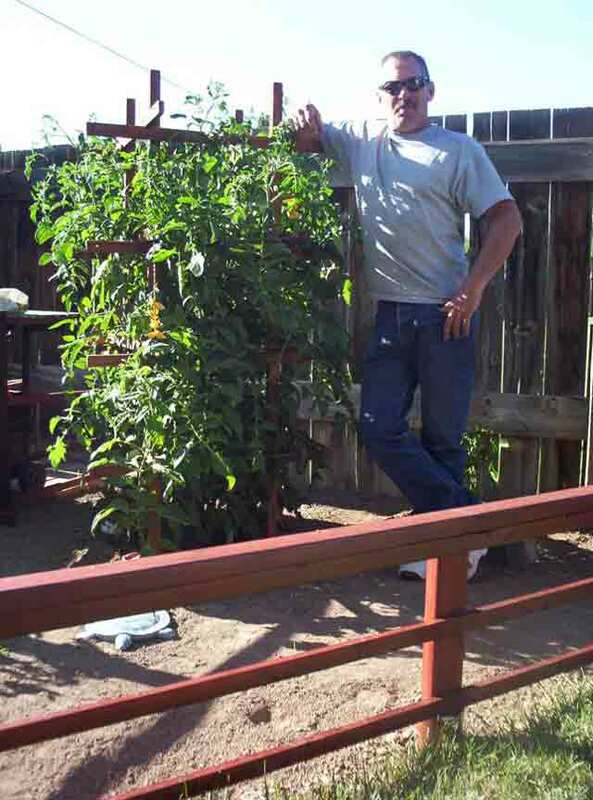 John M. has been gardening for ten years and has watched his garden grow larger with each passing season. 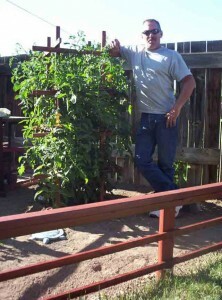 Tomatoes are John’s favorite crop and they grow like trees in his backyard vegetable garden. He admits that it wouldn’t be possible without the religious watering, pruning, and nurturing provided by his lovely assistant Peggy! Great design. Would love to have that in my garden. Would likely grow squash and other vining veggies on that with no trouble at all. Thanks for sharing the tips above, perhaps I can incorporate a trellis into my Earthbox someway with my tomatoes! Do you have a better picture of this trellis, so I can see how it is built and how much space it takes up. He talks of the price being $10.00 ea, where can you buy! Sorry Fran, those are the only photos of the trellis that I have. If you click on the photo it will show you an enlarged view. That was ten bucks to make the trellis… P.J. purchased the materials and put the trellis together himself.